I was looking at Google maps for locations for cycling circuits and it seems that Lim Chu Kang area has quite a few circuits that may be worth exploring. I remembered cycling there before. The area is mostly low traffic, even more deserted than Neo Tiew. I have mapped out 2 circuits. 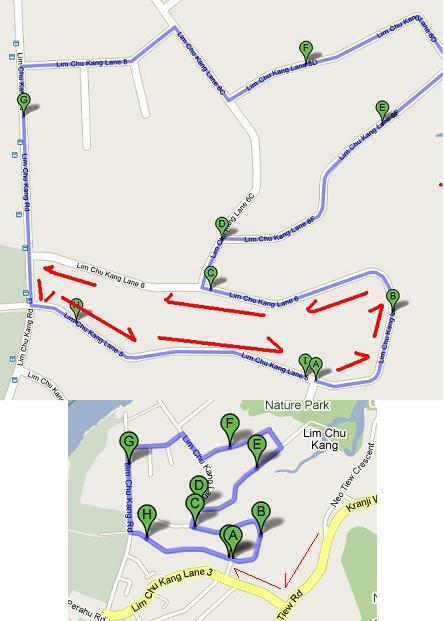 The one in blue is about 6km but there are a couple of right turns. The one in red is 3km and is all left turns and there would be no need to stop for traffic. I believe there within the circuits, there are some farm houses that that sell refreshment and market produce, so we may be able to map out a pitt stop. Anyone interested in doing the exploration? unker yang, certain lanes in LCK are quiet, but got dogs running about. and certain portion of certain lane, the road are very uneven...not good for our tyre though.